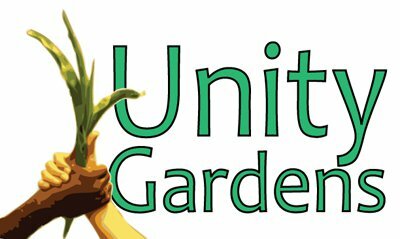 Unity Gardens: Green Thumb ? " What Happened ?" Martin's Greenhouse on Western Ave . donated some flowers and vegetable plants, and we planted both over the weekend. There's two new honeydew melon plants, to add to our expanding fruit selection: strawberries, raspberries, cantaloupe and watermelon are all planted and growing too. One neighbor to the north said they'd try to get us some grapevines, so I'm thinking about where we'll put them. And when I explained to one of the kids that if we planted an apple tree this fall, it would take a few years before we'd have any apples she said: "Well, then you better hurry up ... ."
Six of the eggplant were put in, thanks to help from the same Madison Street kids. They're in a section where we added more tomatoes and a few peppers too. Last weekend, the children planted pumpkin seeds near one of the corn plots, and we're waiting to see how they're going to do. As for the corn, neighbor Linda said she can't believe how tall it's getting. She helps to lead the small Grace Bible church on the block in McKinley and said her members are helping to keep an eye on the garden, too. It's great to see how the garden builds community: Neighbors stop by, cops and firefighters and bus drivers wave, people on bikes say hello. Steve came by Saturday and said he's sorry he doesn't have time to garden with us, but he promised to bring us his grass clippings. Perfect! Valjean helped me to weed beans and potatoes on Saturday, and we harvested mustard greens and collard greens. The first official tomato has been picked too. OK, not the first -- there were two others -- but it was the first that the children helped me to find and then took home with them. I told one of the kids that Valjean sure has a green thumb, and the girl's eyes got big and she said: "Really? What HAPPENED?" Elsewhere in the garden are zucchini and acorn squash plants that have really taken off, and a plot of cucumber hills. I've seen fuzzy baby cucumbers starting to grow, and it looks like there will be zucchini before long too. The marigolds seem to be keeping the rabbits away. So far. We'll see. With the flower donations, we were able to clean up a little on the southwest corner at McKinley, plant a small border and create a container planting for the newly painted picnic table. And with more rain forecast (!) it looks like Monday will water itself again. Regular volunteer times are 9 a.m. to noon on Saturday and Sunday afternoons from 4 to 7 p.m. if you'd like to come by. Great post. thanks for sharing these beautiful posts.